BERDYANSK, Ukraine -- Tamara Dmitruk has nightmares about the day she found her husband's bullet-riddled body under a sheet by the side of the road. Ruslan had left their apartment in Slovyansk the night before to find food for his family. 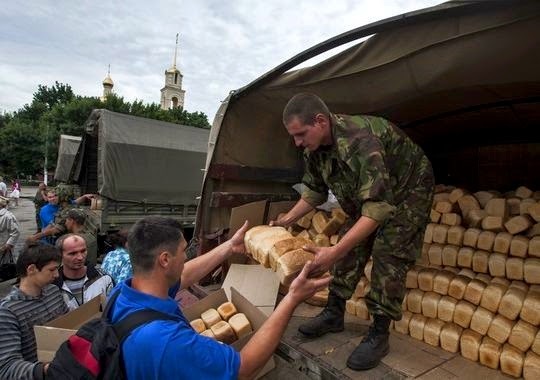 A Ukrainian soldier gives bread to local residents in Slavyansk, eastern Ukraine, Sunday, July 6, 2014. Ukrainian troops on Saturday forced the rebels out of Slavyansk, a city of about 100,000 that had been the center of the fighting. The success there suggests that the government may finally be making gains in the months-long battle against the Russian insurgency. After that happened, Dmitruk, 27, and her 7-year-old son Denis jumped onto a battered minibus with six other women and two children to head for the Svytogorsk Monastery a dozen miles away. They found the 120 monks taking care of 300 other refugees — mostly women and children — from the fighting between government forces and pro-Russian separatists in eastern Ukraine. Dmitruk decided she would leave the Slavyansk area when there was a lull in the fighting — and never return. When government forces chased the rebels out of the area on Saturday, she headed for a friend's home in Zaporozhye, a city of 770,000 that has yet to see combat. She felt guilty leaving her friends at the monastery, she said. "Most of them are staying because they simply have nowhere else to go," she said. The city of Donetsk, another rebel stronghold in eastern Ukraine, is expecting an offensive from government forces. Help rebuild Slavyansk or get a fresh start elsewhere to escape the bloody memories. Rebuilding will be a challenge. Mortars, howitzers, rockets and grenades destroyed 60% of the city, residents estimate. One person who decided to stay is 79-year-old Mariya Strizhova. The retired teacher was heartbroken when her son, Alexander, 47, began fighting with the separatists and her other son, Sergei, 40, with the government forces. Relatives outside Slavyansk offered to pluck her to safety several times, but she refused. "My sons have different views of Ukraine," Strizhova said. "One sees the motherland as the nation of Ukraine, the other as the Donetsk Peoples Republic. But they both have a common motherland — Slavyansk. And I must wait for them here in the only motherland both know." That wait has been dangerous. One day she went out for milk. "A Russian separatist militiaman shot in front of my feet to stop me, and asked what I was doing," she said. "I told him my son was a militiaman fighting for the Donetsk Peoples Republic, and he let me pass." She hasn't heard from either son for months. But she believes that if she continues to pray to Saint Nicholas every night, both will return. Nikolai Prodanov also stayed in Slavyansk during the fighting — in a vain attempt to protect the business he was running. Slavyansk is famed for its spas — many of them in former Soviet bloc countries are combinations of recreation centers, natural-healing centers and medical clinics. The spa that Prodanov was managing was the largest in Slavyansk, employing more than 1,000 people. The shelling by government forces that intensified in June and remained heavy until the separatists left on Saturday damaged many of the spa's buildings. That included the on-site hotel and — particularly upsetting to Prodanov — a treatment center for those with disabilities. Rebuilding will require more than $1 million, he estimates, and he doesn't know whether the national company that owns the spa will find the money right away. "We've gone through all our savings," he said about the conflict's impact on his own family. "In fact, we have little to live on right now." Even if the spa can be rebuilt, Prodanov wonders whether he could find enough workers to reopen it. "Most of the staff left Slavyansk," he said. "The sad thing is that many will never return. Everyone knows the city is going to have to be rebuilt virtually from scratch." One good sign is the phone began ringing after the separatists fled, Prodanov said, with callers wanting to know if the spa was open again. "We've been replying that the war has destroyed the spa, and we don't know what will happen next. We're asking people to call back in two or three weeks. But we don't know if we'll have an answer for them when they do." If Ukrainian government has any agreement with Russia about statues of Lenin in Ukraine, it is a good time to get read of such agreement, and allow people on local level to decide if they want to continue have such statues or get the devil off the pedestal for good. Simplified procedures should be worked out for people to vote and decide.